With the effects of climate change becoming more evident and undeniable, one of the most popular discussions among arborists and gardeners is drought and trees, specifically how to alleviate the stresses experienced by trees and shrubs brought on by drought. This is such a crucial topic because the lack of water won’t only cause certain plants and trees to slowly wilt and die, but it can severely affect plant development and growth as well. Plants, especially trees, can experience short-term and long-term effects from drought. Short-term stresses can go away once rain starts pouring in regularly again. However, the long-term stresses can linger on even after the rain returns. So what are these stresses, these detrimental effects on trees that are brought about by drought? What can you do, as a tree owner, to help your trees survive the drought and recover? As your trees continue to starve from lack of moisture, symptoms will start to appear. Some are quite obvious, while others not so much. Wilting is the first and the most obvious sign of tree health problem brought about by drought, although not exclusively. Wilting may also be caused by other detrimental factors. But this is the first sign that you will most likely notice on your trees and shrubberies during a drought. The fall season is typically the time when trees start to shed their leaves and they prepare to go into hibernation for the winter. 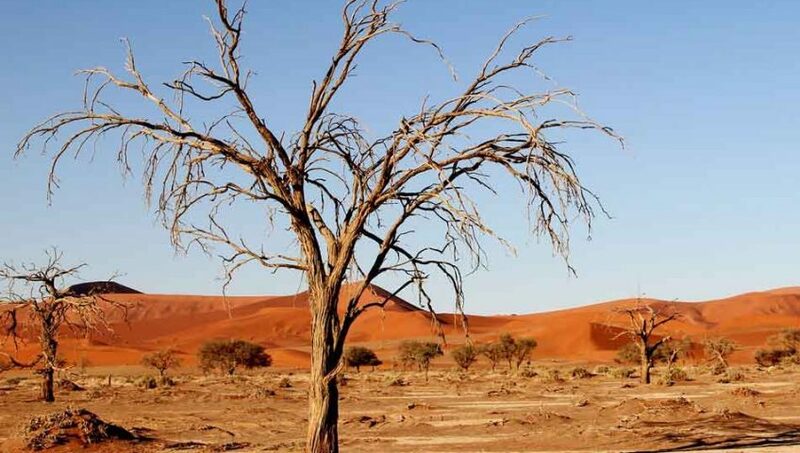 During a drought, however, trees and other plant life can go into premature shedding; their leaves will slowly wither and die, due to the lack of water and ground moisture. There’s just isn’t enough water to sustain the tree, so it starts to shed its leaves as a form of defense. Photosynthesis is crucial to a tree’s growth and development. It’s the machinery that enables trees to absorb sunlight and synthesize foods from carbon dioxide and water. If the tree’s ability to photosynthesize is compromised, it could have serious, long-term, and even fatal effects on the tree’s ability to recover and survive. Imagine if something were to happen to your digestive system, if it’s compromised in some way. How will you be able to process the food you’re taking in? How will you be able to absorb the nutrients that your body needs in order to properly function? With the lack of water and a compromised ability to photosynthesize, trees will become weak and susceptible to pest attack. They won’t be able to adjust or defend against the onslaught of insects that are trying to survive the drought as well. And this will only weaken the tree even more, causing long-term damage that may be difficult to recover from. So those are just a few of the potential effects that trees may experience during a drought. The question now is how do you mitigate or lessen the effects of drought on your trees? What can you do to protect them and give them the best chance to recover? Water your trees, but water appropriately. During a drought, you’re going to need to water your trees and shrubs regularly. But you need to be mindful of the amount of water, the frequency of which you water the trees, and the type of tree you’re watering. Remember that not all trees require the same amount of water or the same frequency. Some species require less, while others may need more. Check your trees for signs of stress. It’s important to inspect your trees for any sign of stress or symptoms, especially those mentioned on the first part of this article, so you can take the appropriate action to mitigate those symptoms. Keep in mind that there are symptoms that take longer to appear, while there are those that materialize almost immediately. Skip the fertilizer and focus on mulching instead. During a drought, a tree’s root system is susceptible to damage from the salts and other strong chemicals from fertilizers due to lack of water. So instead of adding fertilizer, you should do some mulching instead, in order to preserve soil moisture and protect the root system from further damage. Your best asset in helping your trees recover from a drought is having a certified arborist guiding you on what to do along the way. Arborists know about trees better than anyone. So if you see signs of drought stress on your trees, contact your local arborist as soon as possible.